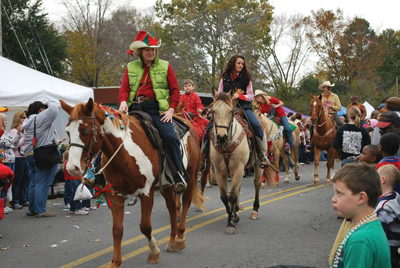 Perched in uppermost northwest corner of Louisiana, the small, charming town of Benton hosts the Christmas on the Square Festival and Parade. This community- and family-driven festivity is produced by and for a population a little under two thousand strong. Benton has not been without drama in the past; in 1999, a destructive F4 tornado roared through portions of the town like a juggernaut. Benton is the seat of Bossier Parish and was named for Senator Thomas Hart Benton, who was a staunch ally of Old Hickory himself, President Andrew Jackson. Many state representatives and judges have hailed from Benton, but perhaps its most famous native son is Billy Bretherton of “Billy the Exterminator” fame on A&E. Benton is the home of the Heritage Village that has some buildings that date back to the 1840s. These include a six-room dogtrot house, an authentic log cabin, a tiny one-room schoolhouse and a blacksmith shop. There on the grounds of Heritage Village Square, Christmas will be celebrated with a 5K run and health walk; a children’s art contest, and picture-taking with Santa and Mrs. Claus. This year’s theme is, “A Christmas Carnival.“ Contests include a children’s archery competition and BB gun shoot-off. Equestrian diversion in the form of horseback rides can also be enjoyed to work up an appetite for the delicious food provided by vendors. Bountiful arts and crafts may provide some choices for excellent Christmas gifts. The Christmas parade fills the street with Yuletide fun and cheer. Live music adds to the enjoyment of all, and children can ride the cow train after their faces have been painted. Wildlife will be present for friendly observation and a rock wall provides the opportunity to work off any extra hot dogs or Christmas goodies you have consumed. A classic car show and a tour of the historic Hughes House help you travel back to the past. Christmas in the Square takes place Dec. 13. Shreveport, part of that Fa La La Louisiana, Holiday Trail of Lights, boasts two beautiful and enjoyable Christmas traditions each December. On Saturday nights during the holiday season, the night sky over the Red River waterfront ignites with showers and fountains of colorful fireworks exploding over the river. Across the water on the Bossier City side, the Boardwalk, a large center for shopping, entertainment and dining, offers ample opportunity for some fine Christmas shopping and holiday joy. Christmas in Roseland is another Shreveport wonder to behold at Christmas. Home to the American Rose Society, the Gardens of the American Rose Center bloom sweetly each December. More than 100 acres of exquisite, velvety roses perfuming the air are decorated beautifully with Chrismas lights and displays. Ride the Roseland express train past giant Christmas cards made by children among the roses and visit the wooden train exhibit. Entertainment is provided each night. On the other side of the state, the Biedenharn Museum and Elsong Gardens in Monroe fill their already-beautiful premises with added Christmas enchantment. Each December the beautifully decorated mansion and grounds are filled with guided tours and exquisite music. In addition to the sparking lights and music, wassail and Santa Claus add to the happiness. But the annual tradition of the poinsettia tree in the conservatory remains a beloved highlight. A “pot tree,” constructed of iron, is filled with over 60 flaming crimson poinsettias to form the shape of a Christmas tree. Louisianians have long known the preciousness of the pecan. If there were two things that could fill me with utter calm (outside of praying) it was to shell pecans and bake homemade bread. Each year on the first full weekend of November, the town of Colfax welcomes nearly 80,000 visitors who attend the Louisiana Pecan Festival. Pecan trees once grew wild and prolific in the Bayou State to which they are native. The Native Americans living here feasted upon them. By the time the white settlers migrated to Louisiana and built their farms and plantations, wild pecan trees were grafted into new cultivations and grew in the fields along with other crops. The land yielded so fertile by the Mississippi River nourished the pecans trees like a mother feeding her child and they grew abundantly. The Louisiana Pecan Festival was an offspring of the 1969 Centennial celebration of Grant Parish as organizers expanded the events. In early November, as Thanksgiving approaches, the festival first begins with an early morning blessing of the crops and then opens full throttle with cooking contests, live music and an antique tractor show. Attendees can visit The Country Store, where they can buy homemade pecan pralines and pies; jams and jellies; homemade soaps or sip some cider while nibbling on cheese and crackers. The popular Sausage Stand adjacent to the store runs out of links quickly while vendors on Front Street offer food and crafts. Performing regularly throughout the three days are the Festival’s ambassadors, the Louisiana Pecanettes, a team of dancers recruited from local area high schools. A ferris wheel and carnival rides fill the horizon as the sound of live music fills the air. Visitors also enjoy costume contests, Saturday night fireworks and the Grand Parade. Area school children are given Friday off since that’s “Children’s Day” at the festival; 15 percent of the profits earned by the celebration are donated to the eight schools in Grant Parish. Kent Plantation located in Alexandria has long been a praiseworthy, interactive little mecca of sorts when it comes to living history demonstrations of crafts performed in centuries past. This November, Kent Plantation, the oldest building still standing in Central Louisiana will hold its annual Sugar Day Festival. Visitors will be treated to craft demonstrations of the art of basket weaving; woodworking; duck carving; spinning; blacksmithing and weaving. Docents wearing period costumes will craft candles and soaps, churn butter and cook in the open hearth kitchen. But the heart of the celebration lies in the art of sugar making, a sweet industry that saved Louisiana from economic ruin in the 1700s after the indigo crops drained Louisiana soil of life. Sugarcane crops revitalized the loam and commercial sugar making revitalized Louisiana’s economy. Although it was mainly a cotton plantation, the resourceful owners of Kent Plantation also grew sugarcane in the fields for their own use. Sugar making demonstrations will begin at Kent House with cane juice that’s already been rendered to syrup. The syrup will be cooked in the smallest traditional kettle over an open fire that’s constantly attended and the syrup is stirred. As the syrup to the point of granulation, the air will be filled with an incomparable aroma similar to that of pralines cooking in a cast iron pot. The aroma lingers around the grounds like good company as visitors enjoy the craft demonstrations, hot tamales, hamburgers, fresh cracklings and open-hearth soup and cornbread offered. The event takes place Nov. 12. Rapides Parish Fair: Oct. 8-12, herapidesparishfair.com. With its majestic oaks and charming gazebo, Magdaline Square in Abbeville will be the shady site of the annual 5,000 Egg Giant Omelette Celebration. Live entertainers slated to perform this year include The Drew Landry Band; Roddie Romero and the Hub City All Stars; Bruce Daigrepoint, and Terry and the Zydeco Bad Boys, all guaranteed to have your feet stomping and your body swaying, filling your ears with zydeco, swamp pop and rhythm and blues. The Juried Art Show only features artisans and craftsmen possessing a high degree of talent ability who have been carefully selected on the basis of authenticity. Offering a wide spectrum of various creations, it provides omelet celebrators the perfect chance to get an early start on holiday shopping. On Sunday, the last day of the celebration, the morning starts with an official Mass followed by the Cajun Challenge Bicycle Ride. The celebration culminates with the cooking of the giant omelet, thus leaving the eternal question: Who gets to scrub the giant skillet? Celebrations of all sizes abound throughout Cajun Country this time of year. Commonly celebrated in Scandinavia, the Feast Day of St. Lucy (St. Lucia) is held on Dec. 13. Traditionally, the eldest daughter of the household dons a long white dress and a wreath filled with lit candles around her head. She awakens her family by singing and bringing them coffee and saffron buns. St. Martinville also celebrates St. Lucy, the patron saint of the blind. St. Martin de Tours Church, with exquisite statues of saints, is filled with illuminated angels glowing in trees. The Church Square is filled with music, food, arts and crafts. After sunset, the square is lit by beautiful Christmas lights to drive away the darkness. Mass is celebrated outdoors, and a Christmas parade travels through the streets of the town. Christmas Under the Oaks in Sulphur is another tradition that takes place during the holiday season. Ancient, majestic oak trees are adorned with Christmas lights, stars and snowflakes. It’s quite a sight to see the old twisted branches and leaves glowing in the reflected lights. Held at the Brimstone Museum Complex in Heritage Square, additional activities to increase the festive mood of the season include the Balloon Parade, Spectacle of Lights and carnival rides. According to writer Emily Chenet Guidry, the word bonfire is derived from the Middle English phrase, “bone fire,” or “fire of bones.” The Druids of the pre-Christian ancient Celts lit them at the time of the summer and winter solstices. In Christian France, bonfires were lit for centuries on St. John’s Eve (June 23) and on Christmas Eve. In Germany, the sonnenwende, or, summer bonfires, were lit to symbolize that the sun, now at its zenith, could go no higher and would descend. During the 18th century, when the French and Germans settled along the Mississippi River in what is now called the River Parishes, they brought their tradition of bonfires with them to Louisiana. The practice has spread like wildfire in more recent years. For the last few decades, countless teepee-like wooden structures burn on Christmas Eve night like giant brilliant candles rising from the levee lighting the night sky. The air is filled with the scent of wood fire and the crackling sounds of burning logs. To the gumbo of the French and German December tradition, the Cajuns added their own bit of spice by designating the bonfires beacons to guide Papa Noel to Louisiana from the North Pole. As soon as Thanksgiving is over, children and adults alike began contributing to the construction of the levee bonfires, especially in the St. James Parish towns of Lutcher, Paulina and Gramercy. But before the Christmas Eve conflagration begins, the town of Lutcher holds the Festival of the Bonfires on the second full weekend of December and transforms itself into a Christmas village, Louisiana-style. Filled with live music and dance performances, the festival also offers a Gumbo Cook-Off, Potato Salad Showdown and Bread Pudding Bake Off contest centered around three dishes that make your mouth water just at the thought of them. Replete with a gingerbread house competition, the festival grounds are filled with arts and crafts along with delicious food. Carnival rides, photo ops with Santa, and a car show with its own parade are part of the activities that also include a 5K Run/Walk and Million Mutt Walk to benefit the local animal shelter. Each night, a bonfire is lit on the levee glowing like a candle on the water. The festival takes place during the second full weekend of December. One late Sunday afternoon during the Christmas holidays, when I was barely in my 20s, my cousin and I got into my very old, very used Dodge Dart looking for an adventure. I wound up driving along the River Road, that, as night began to fall was very dark indeed. Suddenly we passed a shell of a plantation with missing walls and windows, collapsing chimneys, utterly forsaken looking, overtaken by trees and vegetation. It almost looked like it had been gutted by a fire as it gleamed eerily in the darkness yet still seemed to have an aura of promise about it. That bombed-out looking shell has since been transformed into the exquisite Destrehan Plantation. The labor of love to preserve this West Indies-style house that has witnessed the French and Spanish colonial periods, antebellum days, the Civil War and Reconstruction, is ongoing and constant. Tour the house and you will be regaled with family stories of the prior residents who lived through so much. To benefit the River Road Historical Society responsible for the preservation of the plantation, the Annual Destrehan Fall Festival is held each November on the plantation grounds. This year, live entertainment will be provided by Summer Breeze and LO2. Visitors can stroll and eat their way through the Cajun Creole Food Park, enjoy guided tours of the Main House with costumed docents and shop for antiques in the Mule Barn. There will be an expansive arts and crafts area and plenty of activities for Children. The festival takes place Nov. 8-9. 41st Annual Andouille Festival, Oct. 17-18, 2014 Hwy. 51 Park/St. John Community Center, LaPlace. Madewood Plantation, 4250 Louisiana 308, Napoleonville, (985) 369-7151. Growing up in Uptown New Orleans, I ate my first poor boy from Tooley’s Place when I was 3. Getting me to eat almost anything back then was next to impossible; I devoured those crispy, succulent fried oysters in their bed of French bread that was toasted with butter and daubed with ketchup. Along with the tradition of poor boy sandwiches in my neighborhood, there was shopping on Oak Street. This narrow clapboard corridor was a gallery of beguiling little shops such as Melody Lane, where my mother always found the most gorgeous Easter dresses for me; a fabric shop filled with bolts of tulle in all colors of the rainbow; Haase’s Shoes, where you could buy Catholic school regimental saddle oxfords and then have hamburgers at Woolworth’s excellent lunch counter. It’s a magical brew to combine poor boys with Oak Street in the form of a festival. At the corner of South Carrollton and Oak Street, while the stately Nix Library watches from across the neutral ground, this New Orleans staple is prepared, eaten and venerated, ironically, as the clanging streetcar rumbles past. What is now a revered Big Easy tradition was born out of the generosity of Bennie and Clovis Martin, who were once streetcar operators before opening a restaurant in the French Quarter. In 1929, the streetcar conductors and motormen went on strike with overwhelming support from New Orleanians. Over 10,000 citizens watched as the strikers destroyed and burned a streetcar run by a strikebreaker. The Martin brothers fed the striking men poor boy sandwiches free of charge for the two-week long strike. Their generosity and delicious sandwiches became, and remain, renowned. This November, Oak Street will be lined with the sidecar loaves filled with shrimp, oysters or wonderfully sloppy roast beef, to name a few. Last year, contest winners in the categories of best shrimp, sausage, specialty seafood and oysters were the po’boys called Blackened Shrimp and Avocado; Chaurice and Kim Chi; Seafood Au Gratin and Barbecued Oysters, respectively. Live music is staged at various corners along Oak Street. The Oak Street Po-Boy Festival is held Nov. 23. This December, beautiful, historic Fort Jackson in Buras will once again be the site of the Plaquemines Parish Fair and Orange Festival. Since the festival began in 1947, the parish citrus growers have weathered catastrophes of biblical proportion such as monumental freezes and those three nasty ladies, Betsy, Camille and Katrina. But they remain stalwart and return to celebrate their Parish and grow crops that are the colors of the sun during daybreak. We can thank the Jesuit priests for planting the first citrus trees in Louisiana during the 1700s. Plaquemines Parish is where the boot that is Louisiana dabbles its toe in the Gulf of Mexico – this seemingly precarious position might be the key to the tastiness of the citrus grown there. The skin is thinner, greener, and like Creole tomatoes and watermelons grown in the rich Louisiana loam, the flavor is distinct with a tincture of freshness almost hard to define. Sweeter and less acidic, citrus growers can tell you why: the thickness of the local soil that has less sand than California or Florida, and the high heat and humidity during the day followed by nights cooled by the Gulf of Mexico fill the fruit with higher levels of brix, or sugar levels. ‘Tis the season when the market will be flooded with kumquats, blood and navel oranges, satsumas, grapefruit and Meyer lemons all grown in Plaquemines Parish. Under the sea-twisted trees of Fort Jackson, the festival grounds will be filled with citrus bounty and orange wine, while seafood-eating contests, oyster shucking, duck calling, orange eating and orange peeling contests are held. Children’s contests include pie eating, orange rolling, sack races and the shoe find. Helicopter rides will let you tour the local sites from on high. The festival will take place Dec. 5-7.